With digital image processing of this conventional photography the skybackground was subtracted and the contrast enhanced. The colors and especially the faint emission nebulae are better emphasized in comparison with the original color slide. 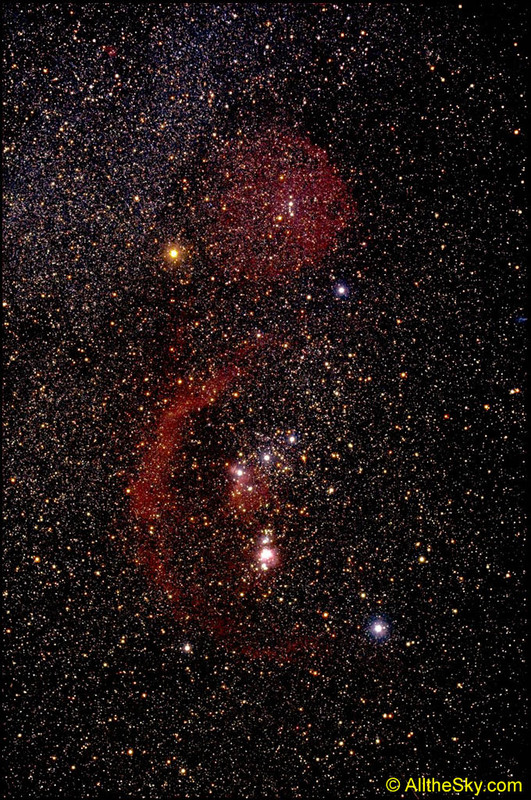 The striking features in this image are the big red emission regions Barnards Loop and the Lambda Orionis Nebula (around Orions "head"), both predominantly visible in the light of ionized hydrogen (H-alpha, 656nm). Barnards Loop is a remnant of one or maybe several Supernova explosions. This loop is, as known from radio-astronomy, much more extended than it can be seen here. Just the inner part of the material is ionized by high energetic radiation of the Orion OB1-Association. 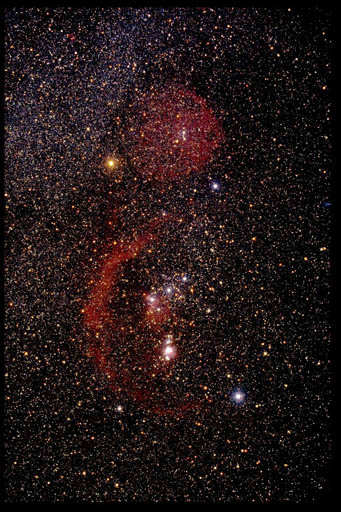 This are the blue, hot and massive stars of Orions "belt" and the surrounding. A completely different star color is shown by Beteigeuze (Alpha Orionis, left "shoulder") with its intensive orange. The surface temperature is with 3500 K very low and so the maximum of the radiated energy spectrum is positioned in red. More informations can be found in the Orion constellation page! Astronomia, a comprehensive astronomical Web-Page in spanish by Antoni Parra.